Towing a vehicle behind an RV can be a fairly complex undertaking, which is not always apparent at the outset. In the early days of dinghy towing, things were much simpler; tow dollies were more common, tow bars were basic welded A-frames, and supplemental braking requirements and systems were unheard of. Motorhomes were much smaller and tended to be both underpowered as well as under-designed, and diesels were rare, so towing was not common. I remember occasionally seeing a motorhome towing a Volkswagen beetle or similarly small vehicle with one of the aforementioned tow bars. Times have changed, and instead of simply bolting a tow bar to the front of a vehicle and removing the driveshaft, many things have to be taken into consideration before a “toad” is ready for the road, including the method of towing. Flat towing is by far the most convenient and common method of towing. This involves installing a base-plate onto the towed vehicle, which is used to attach a tow bar. The toad must also be wired for lights, and most states and provinces require towed vehicles to have supplemental braking systems. Regardless of these additional requirements, flat towing is preferred due to its simplicity. Modern tow bars come in many styles, including those that are installed in the towing vehicle hitch receiver and can be folded against the vehicle bumper when not in use. The downside of flat towing is that only certain vehicles can be towed “four down”. Some RV trade magazines annually publish a list of vehicles that can be flat towed. This information is also available from vehicle manufacturers. It is important to note that even vehicles that can be flat towed sometimes require additional modifications such as lube pumps or driveshaft disconnects. 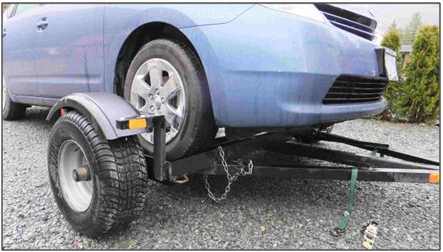 If you have a front-wheel drive vehicle that can’t be flat towed, it can generally be loaded onto a dolly. I drive a Prius, which can’t be flat towed, therefore I use a dolly. For dolly towing, the toad is driven onto the dolly using ramps, then secured using chains and straps. Lights are generally required on dollied vehicles, even though the dolly itself is so equipped. If your dolly is not equipped with brakes, a supplemental braking system for the towed vehicle is required. If your vehicle is not a front-wheel drive, or can’t be towed on a dolly, a trailer is required. Vehicle trailers are generally very heavy and difficult to maneuver and store. Lights and brakes are required on a trailer, so are not needed on the vehicle itself. One benefit to trailers is that any type of vehicle can be loaded and no additional modifications are required. Although the specific vehicle you tow is likely to dictate the method of towing, there are additional pros and cons to each towing system. These should be carefully researched and considered before purchasing and implementing your chosen technique. Whether you are flat, dolly, or trailer towing a vehicle behind your motorhome, be sure you familiarize yourself with the laws of all states and provinces you will be travelling through. There are many different laws regarding licensing, lights, and brakes on towed vehicles, so it is important that you conform to wherever you are visiting. Interesting…. I owned a prius and my dealer did not want me to tow on a dolly. I figured it was because of the wheels turning charging the battery. The back wheels don’t charge the battery do they? I wouldn’t think so unless it was all wheel drive. Good article witha lot of good general information. I was wondering about the statement “most states and provinces require towed vehicles to have supplemental braking systems.” Where can I find a list of these states since I am sure they are not consistent. Prudence certainly dictates the addition of braking systems, but the requirement in some states are ambiguous. For example, VA doesn’t require brakes on a towed vehicle, only on trailers over 3000 lbs, doesn’t mention towed vehicles, but I wonder what the police would say if you had an accident without the supplemental brakes..
A state by state map is toward the end of the 2015 Dingy Guide. First, I absolutely believe in having supplemental braking systems on towed vehicles. However, in researching the laws of several states, I have yet to find any state in the US that requires such on a towed motor vehicle. Like almost all states, my state of Delaware has braking laws for trailers, but specifically defines “trailer” in a way that excludes motor vehicles. I believe that to be true of all states (but not certain provinces of Canada). The maps published by motorhome-related magazines, and in braking system sales brochures, all related to the state laws applying to *trailers* (note the maps always show Delaware, for instance). Again, I believe in (and use) supplemental braking systems. But I also believe that stated “facts” should be based on truth. There are three basic safety and regulatory issues that must be considered when towing a vehicle. These are brakes, lights, and plating (as in license plates). The last two primarily apply to tow dollies. I can’t comment on the laws of specific US States or Canadian provinces other than my own. In British Columbia where I live braking is required by law, depending on the weight distribution. To further support Bill’s comment, we have laws that limit when supplemental braking is required, and even though my vehicle combination doesn’t specifically require it, I always use it. Bill, and other readers, may wish to visit this link, which identifies the towing and braking requirements for various states. I have used Delaware as an example. In this case, supplemental braking is required for tow vehicles over 4,000 lbs. Although the GVW will vary, this is a fairly typical law used throughout the US and Canada. The best decision is always to use supplemental braking system. Bear in mind that even if it not required in your home state or province, you may be travelling through a state or province where it is required. And for me, safety trumps everything! In terms of the law, you can always contact your local police or department of motor vehicles for information. Thanks to Coach-Net for the additional information, including confirmation of towed vehicle braking laws in British Columbia. “§ 4305 Brakes — Trailers and semitrailers. Clearly a motor vehicle is not included in the Delaware law concerning braking while being towed. This brings into question all of the charts that claim to prove that most US states require supplemental braking systems on towed autos. In fact, I still maintain that NO US state has such a law. Since we all agree that aux. brakes are great, why are we wasting time picking the laws apart like some lawyers. We have our aux. brakes, so let’s enjoy our RV travels, have fun & stop acting like some silly kids bickering whose dog is bigger. Just a comment from a old red-neck that enjoys traveling & has better things to worry about than silly laws that I have covered anyway. I have a Honda del Sol, very small compact car, 5 speed manual transmission. Is this something that I could flat tow? Also I don’t have an RV yet and want a small one (it is just me that will be traveling as a single woman). I am not sure how powerful of an RV I would need to tow a small car.